Buy in to super low bow hockey stick technology with the adidas TX24 Compo 2 review for less than £150, bargain! 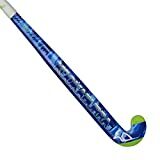 In the current 2015 model of the adidas TX24 Compo 2 hockey stick you are getting a stick balanced for pro strikers for around £125 on Amazon, now that is a really great way of getting the benefit of a low bow hockey stick. Yes you are giving up a little carbon content, the TX24 Compo 2 from adidas only has 50% carbon fibre content, but with the reinforcement in the face and reverse edge being aramid you get plenty of power from this stick. If you’ve heard the phrase “it’s not what you’ve got, its what you do with it that counts” and you believe in it then the adidas TX24 Compo 2 is giving you everything you need to make use of low bow style sticks. Flicking, 3D skills, maybe even a cheeky drag-flick here and there is always possible with the awesome XXTREME24 shaft shape is used by elite strikers in international hockey teams the world over and can be yours with this adidas TX24 Compo 2 hockey stick. The TX24 Compo 2 also features the really nice quality adidas adigrip tape round the handle which feels fantastic in your hands and is found on all top of the range adidas sticks. You will enjoy the grip even more with the TX24 light weight! Just like it’s bigger brother, the TX24 Carbon, the adidas TX24 Compo 2 is really nice a light and can be thrown around the ball and pitch really easily. As well as the feel the adidas TX24 Compo 2 looks amazing, with the same design as it’s bigger brother it is a real adidas master piece with the classic 3 strips on the reverse and the world famous adidas logo on the front and reverse side of the head. adidas’s low bow options are the TX24 in Full Carbon and this Compo 2 version with 50% carbon, otherwise you can choose a DF24 Carbon or Compo 1 but all other options to get access to the adidas unique 200mm low bow shaft shapes require you spending more money on carbon fibre. Although 50% carbon looks low when put up against other sticks of a similar price, you are buying in to a great shape stick with nice top end features in the adigrip and design so the TX24 Compo 2 is good value for money in the grand scheme of things. Because of the reinforcement and low bow position we don’t think any intermediate player will notice the difference in power and will keep a few quid to buy beer in the bar after many games compared to the more expensive models, maybe to celebrate all the goals!